The last time I checked, it was the beginning of the new year. And blink!!! a good two weeks has whizzed past and Shankranti is already here!!! A very happy Shankranti to all my friends and readers. Makar Shankranti is one festival that is celebrated all across India in different styles and forms. This is a major Hindu festival that signifies the beginning of Spring. Shankranti is a harvest festival that is known to fall on the same date every year. 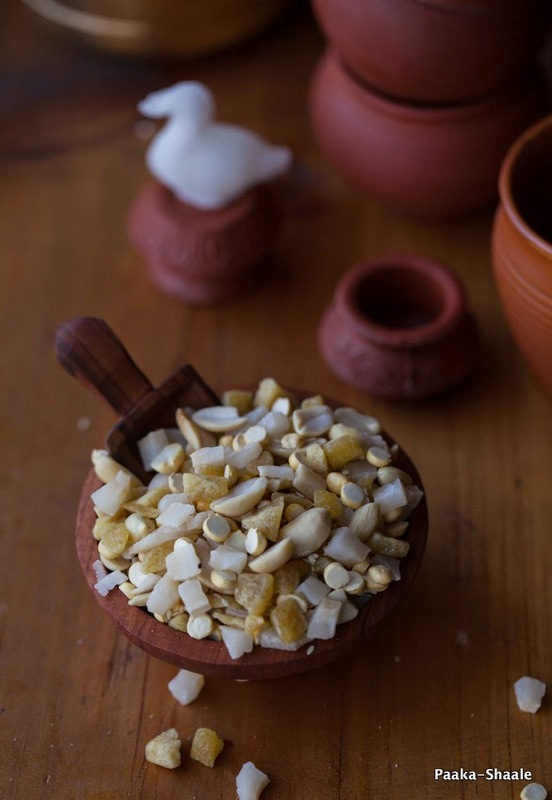 In Kannadiga homes, it is mandatory to prepare the mixture of Ellu bella (Ellu- meaning Sesame seeds and Bella meaning Jaggery). 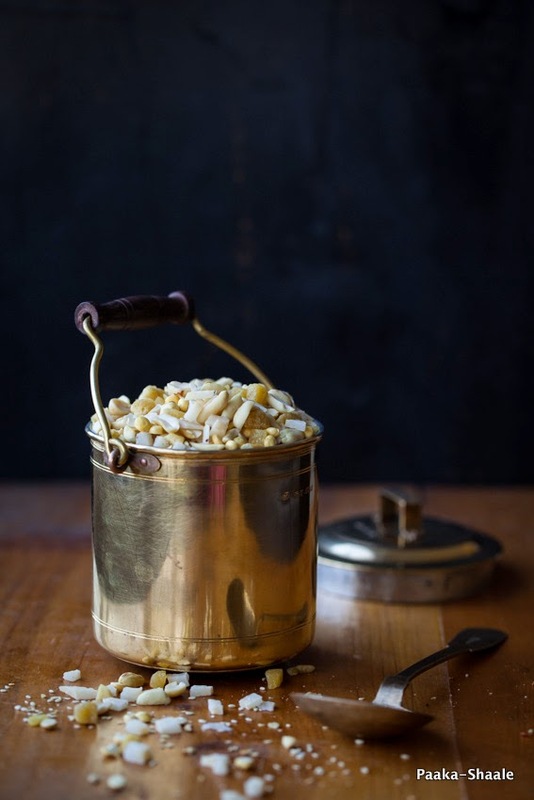 The Ellu bella is nothing but a trail mix of Jaggery, Sesame seeds, Peanuts, Dried coconut and Roasted gram. 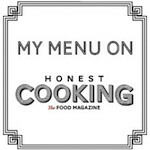 It is an amalgamation of simple and wholesome ingredients and anybody can make it. But what makes this mix really special is that, it is never made by handful or spoonful. Despite the hard work of chopping and roasting and cleaning, the Ellu bella is always made in quantities that is large enough to be shared with atleast ten houses. Well at least that's how it used to be. Since the ellu bella was not sold in shops back then, I remember, my mom would start preparing the ellu bella mixture a good ten days before Shankranti. She would start the process by gently grating the outer brown skin. She would carefully dice the coconut into small equal pieces. It was then followed by chopping the cubes of jaggery into small cubes. She would then toast the sesame seeds and the Roasted gram on low heat. She would then take up the messy job of roasting and cleaning the peanuts. After all this was done, she would mix up the ingredients and store it in a huge container that was as big as a bucket. If you think the preparation would end here, then you are wrong. My mom would stitch tiny potlis (small bags with a thread lock) to give away the ellu bella mixture in them. It was less of a preparation really and more about customs and rituals. Although I live in the contemporary times, I firmly believe in keeping the tradition alive. I think deep down inside me, there still dwells an old fashioned woman. So this time, I decided to make ellu bella from the scratch just like my mother. I could have brought the ready made mix from Bangalore. But making it from the scratch was somehow satisfying. When we started the auspicious day by consuming this home made ellu bella, I was filled with a feeling of achievement. The highlight of Shankranti, has to be the ritual of Ellu birodu. The ritual where, young girls and married women, dressed in all finery, visit near and dear ones with the customary Shankranti offering. 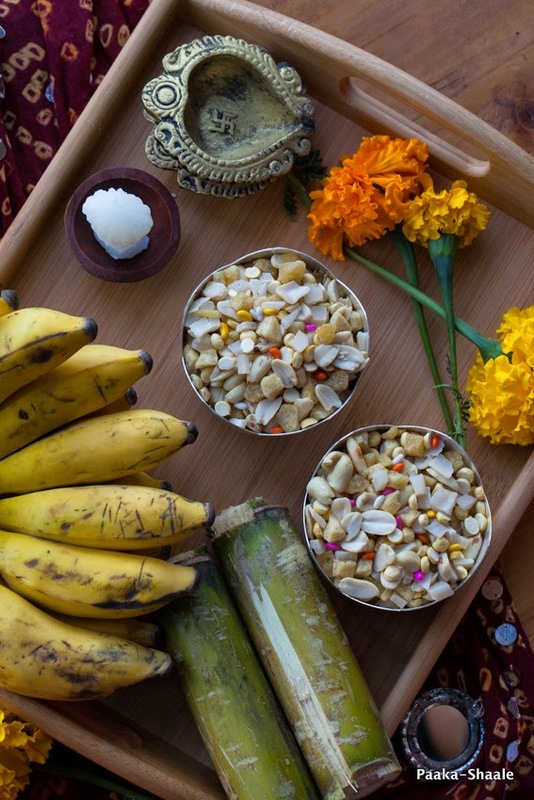 The shankranti Potpourri normally consists of Ellu Bella, Fresh Sugar cane, Sugar candy moulds (sakkare acchu in kannada), Bananas, Berries, flowers and turmeric-vermilion. 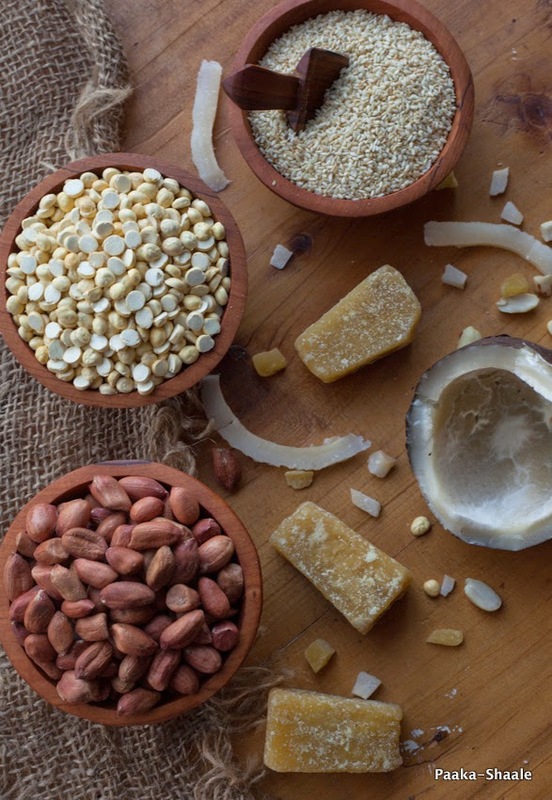 There is a saying in Kannada "ellu Bella thindu olle maatadi" which translates to "eat the mixture of sesame and Jaggery and speak good words". In some parts of Karnataka, it is customary for newly wedded woman to give away Bananas for a period of five years to other married women from the first year of marriage. But the quantity of bananas are increased by multiples of five with each passing year. It was hard work and it took me a long time to make this this traditional trail mix. But the fact that I am acting as a link to the next generation is reason enough to learn and make it. For I know, that there is a small chance that Purvi will continue to learn and enjoy the traditions as much as I do. Happy Shankranti People. May this year be filled with fun, food, peace and prosperity. 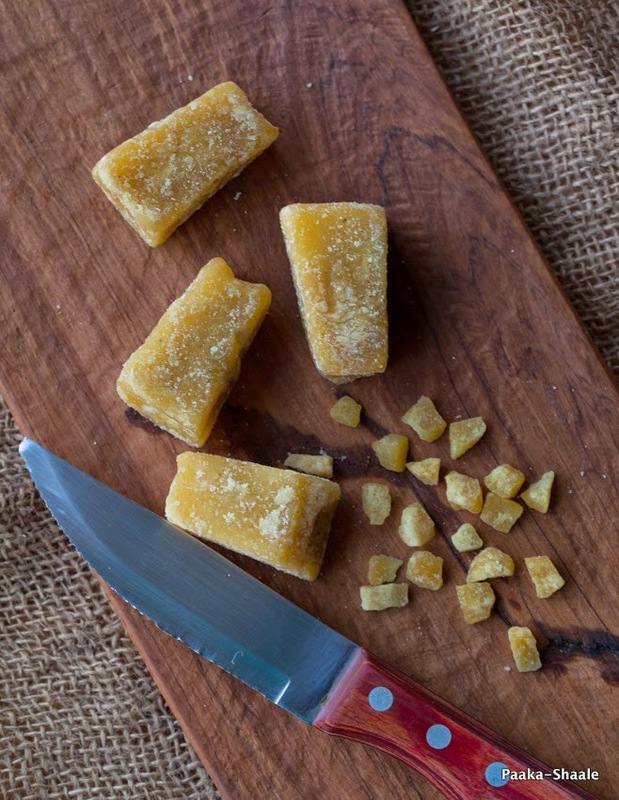 Dice the Jaggery cubes into small pieces and keep aside. 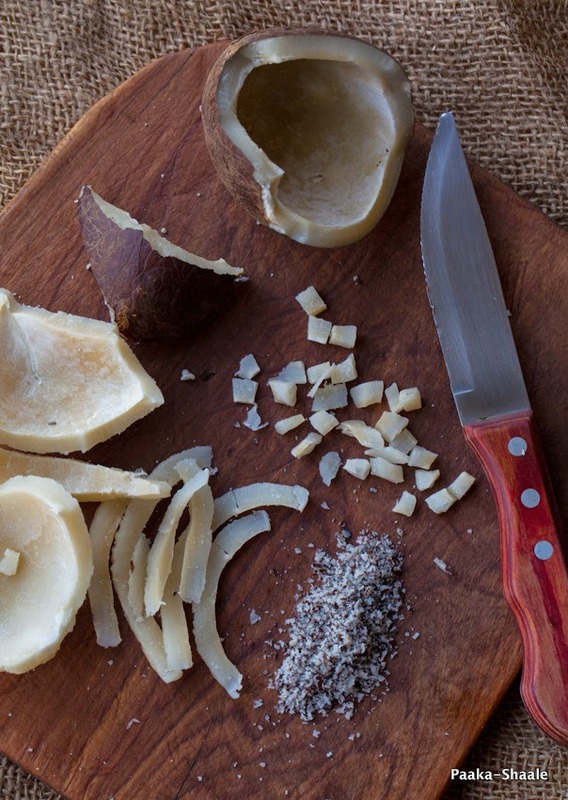 Gently grate the outer brown skin of the coconut and cut them into small pieces and keep aside. Gently toast the roasted gram on low heat and set aside. In the same pan, toast the sesame seeds till pale brown and keep aside. DO NOT wait for it to crackle. To clean the Peanuts, roast the peanuts in a pre heated pan by sautéing continuously till they crackle. Take off the heat and allow the peanuts to cool completely. 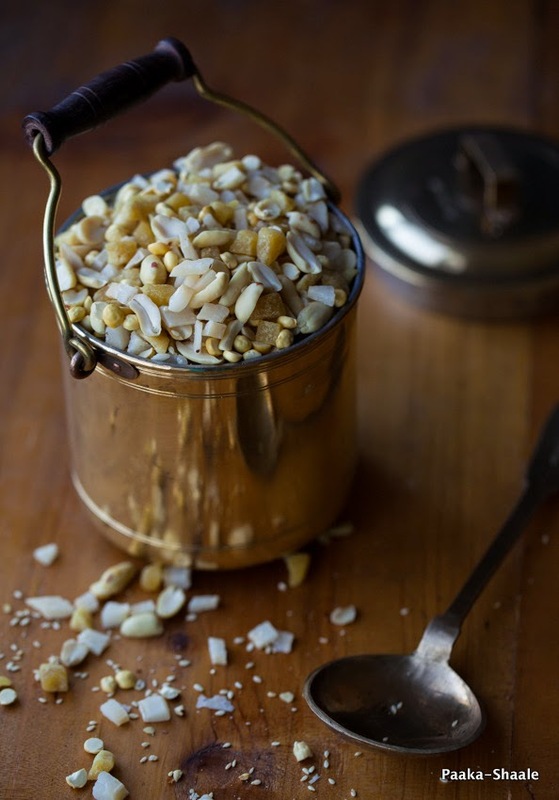 Spread a tea towel on the kitchen counter and place a hand full of peanuts on the towel and bring the edges together. Using your hands, rub the peanuts between the towel and work surface so that the friction created, loosens the skin. The skin will not fall off instantly. Separate the ones which have lost the skin and continue the same procedure with the rest. The peanuts should be pale brown in color without any burnt spots. Take all the prepared ingredients in a large bowl and toss them well and store in airtight containers. Do not throw away the grated brown skin of the coconut. It can be used in any recipe that calls for grated dry coconut. Do not fry the roasted gram till brown. It should be warmed on low heat. I found that using a ridged kitchen towel creates more friction and makes the peanut skins come off faster. If you are not fond of consuming ellu bella in the mix form, then just pulse them in a blender to a fine powder, shape them into laddus and enjoy!! Thank you so much KAlyani!! !